Cherries are one superfruit you don't want to miss out on. 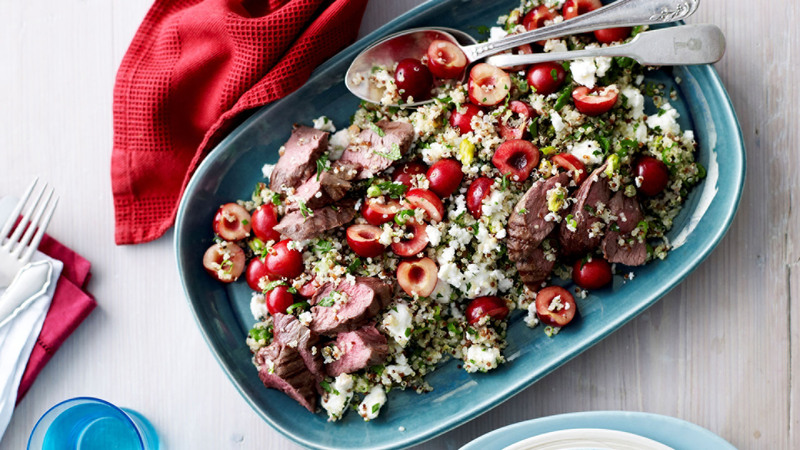 Here's a delicious take on a lamb salad. 1. Combine water and quinoa in a saucepan and bring to the boil. 2. Reduce heat to a simmer, cover and cook for 15 minutes or until grains are tender. 3. Drain, then transfer to a large bowl and set aside to cool. 4. Lightly coat the lamb fillets in 2 tablespoons oil; season well with salt and freshly ground pepper. 5. Heat chargrill pan over high heat then cook lamb for 6 minutes turning or until cooked to your liking. 6. Transfer to a plate and cover loosely with foil. Set aside to rest for 5 minutes. 7. Meanwhile, whisk remaining oil and lemon juice until combined, then add to the quinoa and toss to coat. 8. Add remaining ingredients to bowl and toss well to combine. 9. Slice lamb and serve on top of salad.